As you know, last winter defeated the Tiny. My solar system wasn’t enough to power my electric heater through the long, bitter-cold nights. This left me frozen, literally in the dark, and with no running water. When I decided to try living in the Tiny again this spring, I vowed to do a better job preparing it for winter. Now, I’ve had all summer to get the preparations completed, but of course haven’t started until just recently. It’s not winter yet, but it took some colder weather to remind me why these plans were so important. I usually learn the hard way more than once (which would have meant waiting until I was freezing and completely unprepared to actually change anything), but I’ve been working on finding the path of least resistance. So, this fall has been time for projects and chores! The first step was getting the house set up to use shore power during the winter as the sun is much more limited. That turned out to be a rather extensive project due to some complications – more about that in a later post – but everything is plugged in now! Since I have shore power, the electric heater will be a back up for this winter. The primary heat source will come from this fall’s biggest project! 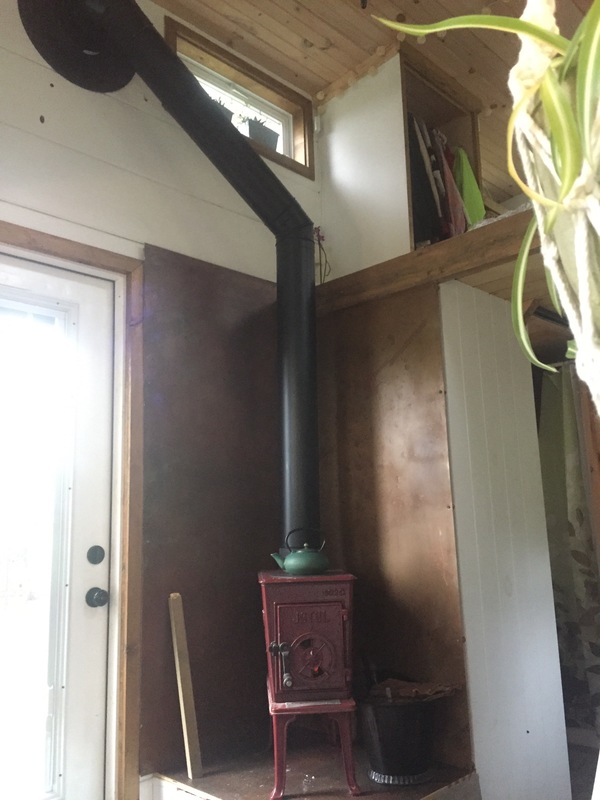 The wood stove! I have to be honest, I’m not sure what was harder, thinking about getting the install started or just doing it! It turned out to be about three to four full days of work, spread out over a few weeks of hours here and there. I started with the sheet metal you see here, and finished with the hole-in-the-wall-chimney install. The other winter preparations involve insulating my water line and building a skirt around the bottom of my house (between the ground and my floor). So, here’s to learning the hard way, but only once! Bring it on winter!